In this paper, we study the random methods for parameterized problems. For the Parameterized P 2-Packing problem, by randomly partitioning the vertices, a randomized parameterized algorithm of running time O *(6.75 k ) is obtained, improving the current best result O *(8 k ). 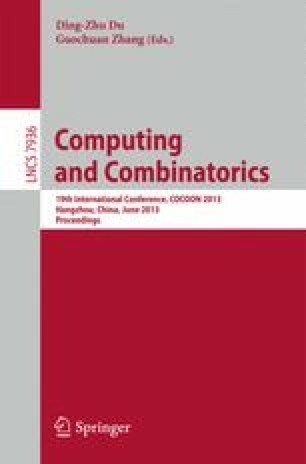 For the Parameterized Co-Path Packing problem, we study the kernel and randomized algorithm for the degree-bounded instance, and then by using the iterative compression technique, a randomized algorithm of running time O *(3 k ) is given for the Parameterized Co-Path Packing problem, improving the current best result O *(3.24 k ). This work is supported by the National Natural Science Foundation of China under Grant (61232001, 61103033, 61173051), Postdoc Foundation of Central South University.